When it comes to finding a good bookshelf speaker, you can get confused by all the manufacturers and all of the optios they have. We took a deep look at the Polk Audio RTI A3, and were happy to give it the title the best bookshelf speaker under $500. The Polk RTI A3 gained a lot of reputation for being very high-end, while still being affordable. It offers some of the best features that you can possibly ask for, and still, it is a very easy purchase. So, keep on reading our Polk RTI A3 review to see if your audiophile needs can be met by this amazing speaker. In a nutshell and as one reviewer says, “Great sound for peanuts“. One of the best things about the Polk RTI A3 is its vintage yet stylish design, which makes it fit into any décor perfectly. With its classic Polk performance, this speaker produces incredible sound clarity. Chunky and solid build, designed to last and comparable sound to a floor-standing speaker. It’s been reported that sounds may not be as rich as you’d expect when listening to music with a lot of bass. Not a con for many, but for some this bookshelf speaker may be a little on the large size. 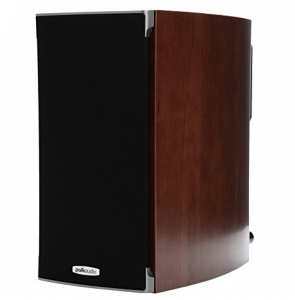 It is a fact that a speaker like the Polk RTI A3 is very hard to miss. It is basically the largest Polk bookshelf speaker. This is exactly why it has the performance and the sound of a floor-standing speaker. Most importantly, it features an excellent 6 ½ woofer, with Dynamic Balance. It also has a 1-inch dynamic balance dome-tweeter providing excellent sound. If you are not amazed yet, we should mention that it can handle an incredible 150 Watts of power. What do all these numbers mean for you as an audiophile? Well, one thing is sure – having such a powerful speaker in the comfort of your home means that you will can get a professional home theatre system setup for a very affordable price. It also means that it is perfect for discerned stereo lovers and kicking out some volume. It weighs around 16 lbs, making it a perfect fit for almost any surface, although bear in mind it’s a bit bigger in size than some of the others. So, if you have decent space on your shelves and you are on a bit of a budget, the Polk RTI A3 bookshelf speaker is possibly the best way to get high-quality audio for a fraction of what you would normally pay. We have to start by stating a few of the most important features (that may just sweep you off your feet). The RTI A3 has a ton of features usually found only in pricey speakers. The incredible Dynamic Balance polymer composite and the silk/polymer tweeter are just some of those. In addition to this, the Polk features PowerPort tech which increases bass response. This also prevents unwanted distortion, leaving you with just the perfect sound. Moreover, the A3 also has an 8-ohm impedance and nice, bass-reflex ported design. Its extraordinary frequency response ranges from 50 to 26,000 Hz. Design-wise, there are a few things that you will notice. First of all, the Polk has a beautiful, real-wood veneer finish, which makes it perfect for both modern and vintage-looking interior. In addition to this, it has the perfect size to actually fit anywhere, without it looking bulky or taking up room space. It also comes in two colors – cherry and black. In the case of the RTI A3, what you see is what you get. So, as long as you think it will be a good match, it very likely will be. In the end, you will end up with a high-quality and modern-looking speaker for only a fraction of what you would normally expect to pay, and we think that’s pretty awesome. We have to sum-up our Polk RTI A3 review with a few thoughts. Asides from the excellent connectivity, among other features, the A3 makes sure that even audiophiles on a budget can enjoy high-quality stereo in their home – even those with larger budgets should seriously consider this speaker. The RTI A3 is something we definitely recommend having on your list of must-have pieces of audio gear. 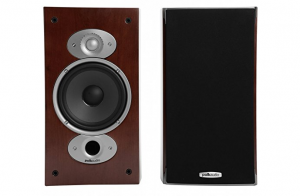 Why not check out the Polk RTI A3 on Amazon and see the reviews from other buyers?